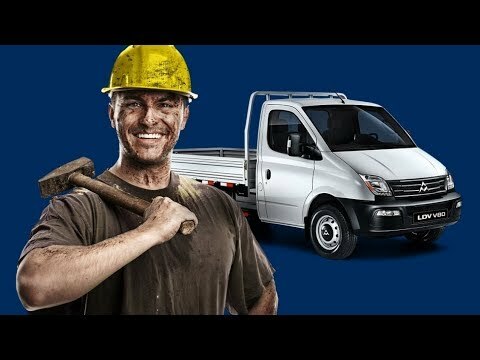 Travel in comfort with large loads securely held with the LDV V80 Chassis Cab. This versatile vehicle fits in well with a fleet of vehicles, carrying heavy cargos and providing easy means of unloading. The chassis cab can be built to suit your requirements Choose from three body styles: Dropside, Tipper and Luton Box. Each one has their merits and they are designed to carry different loads. They all share the same cabin with its bold bumper made from a resilient plastic to endure uneven surfaces. Daytime running lights bring a professional edge to the van. Inside, you will find a spacious cabin with an upright seating position for all three seats. The driver’s seat has an armrest for extra comfort, and there’s air conditioning to keep you and your passengers comfortable. Carry large loads in the V80 Chassis Van, safe in the knowledge that it will be held safely in place. The Luton Box van has less lashing points, as it the walls help to keep the cargo in place. A light in this van’s payload area makes it easier to manage the cargo at night. Eight load lashing points and six roping hooks can be used to tie down the cargo, and there’s an access step so you can climb up to the payload area safely. All three of the V80 Chassis Cab models are powered by a 2.5-litre diesel turbocharged engine. The turbocharging technology provides strong power so it can perform well even when carrying heavy loads. For your safety, the V80 Chassis Cab is fitted with ABS and EBD, helping you to avoid skidding when breaking. Reversing parking sensors also help to keep you and pedestrians safe when getting into small spaces. For comfort, it comes with cruise control and a radio with MP3 capacity so you can relax on longer journeys. Bluetooth connectivity will sync with your mobile phone so you can contact colleagues throughout the day. You are welcome to view and test drive the V80 Chassis Cab from our Smethwick dealership Contact us today to book your appointment.